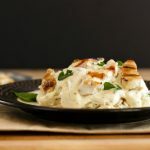 Grilled Chicken Alfredo Celeriac Noodles Low Carb is such an incredibly tasty low carb, keto and gluten free meal. 2 cups spiralized boiled celeriac noodles , or spiralized cooked zucchini noodles, or cooked spaghetti squash noodles. In a medium saucepan over medium heat combine: butter and cream cheese. Melt and stir butter and cream cheese until creamy. Add heavy cream, garlic powder, and grated Parmesan. Whisk until smooth. Add ⅓ cup to ½ cup plain unflavored unsweetened almond milk to thin. Whisk until smooth and turn down heat to low. Heat a stove top grill pan or grill to medium high. Brush grill or pan with avocado or olive oil. Grill chicken tenderloins for 4 to 6 minutes on each side until done. Remove from heat. Place cooked spiralized vegetable noodles of choice on a plate and add alfredo sauce. Sprinkle with optional chopped parsley and place grilled chicken strips on top. Serve.